Lawyers will be put through their paces in a charity run to raise funds for survivors of brain injury. 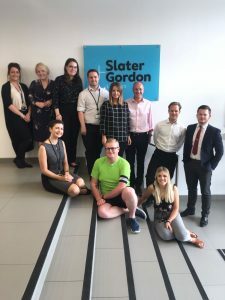 Twenty sporting enthusiasts at Slater and Gordon’s Cardiff office are entering the city’s half marathon to help local branches of Headway in Bridgend, Swansea and Pembrokeshire. Team captain, Tom Mulcock, had never run before signing up for the October fundraiser which sets off from Cardiff Castle, taking in some of the capital’s landmarks and stunning scenery along the 13-mile route. It inspired him to join a running club in his home of Pontypridd and he now trains three times a week, often fitting in a few miles before work. Tom, 25, who is based at the office in Dumfries Place, said: “I’m not a sporty person at all, I’ve never even run for a bus! I’ve gone from doing absolutely nothing to training three times a week, but I’m really enjoying it. “Some of us are quicker than others – there’s a few serious runners then people like me who are just starting out – but we have all agreed to meet at the beginning and the end. “Everyone keeps saying the atmosphere will carry me round. The half marathon is quite a big thing in Cardiff and everyone comes out to support you including some of our colleagues who have promised to cheer us across the finish line.